I like symmetry. My last UEFA Cup tie was on Wednesday 23rd November 1983, over TWENTY SEVEN years ago. It was the beginning of the end of Watford’s six game European adventure, a 2-3 home defeat at the hands of Sparta Prague was followed by a 4-0 routing on an icy pitch in the Czech capital two weeks later. So, when my co-author of Modern Football is Rubbish suggested a trip to Anfield to watch his beloved Reds in the Europa League against, you guessed it, Sparta Prague, I jumped at the chance. We might not be traversing the nether-regions of the continent, but there was still the obligatory train trip, this time just a straightforward hop from Birmingham to Liverpool Lime Street. The 6pm kick-off meant we didn’t have time to dawdle and before we knew it we were standing outside our hotel, the excellent and individual Parr Street Studios, waiting for a taxi to the ground. We were soon joined by an Australian Liverpool fan on his first trip to Anfield. A few minutes later our number was bolstered by a Sparta fan who had travelled from Prague to Liverpool for £30 less than it had cost our Australian friend to get here from London by train. If the taxi didn’t turn up soon, we’d have to upgrade to a mini-bus. As it happened, the taxi journey to the ground turned out to be one of the highlights of the night. It was like an impromptu world football summit, I’m convinced that in the 30 minutes it took us to battle the rush-hour traffic we solved most of the games ills. I’m also sure Jim Davidson (no relation, fortunately) could have conjured up some deeply un-PC joke about a taxi containing two Englishmen, an Australian, a Czech and a Pole, but we made do with setting the (football) world to rights, with expert contributions on the state of Polish football from our cabbie delivered, albeit, between ‘ambitious’ overtaking maneuvers. The highlight for me was discovering that our Prague fan was exactly the same age as me and had been at the Letenský stadion to witness Sparta’s demolition of Watford’s youth team all those years ago (we were decimated by injuries and, as a paid up Junior Hornet, I was gutted not to make the bench at the very least.) Eventually, the traffic ground to a standstill and we took our leave: £6 for one of the most entertaining and informative taxi journey’s I’ve ever had. Before long, we said our goodbyes to our Prague supporting friend and headed for the turnstiles. The Kop. I was intrigued and excited to take my place in one of the most revered ends in football. My perception has been influenced by years of football folklore and a few fanciful tales told by our resident scouser, Jimbo, at university many years ago. My first impression was a good one. The concourse under the stand was bright and spacious, the toilets vast in comparison to those I’d queued for in the Westfalenstadion only a few days before, but this isn’t Grand Designs and I’m no Kevin McCloud, so onwards and upwards to Block 203 high in the Kop end. We got to our seats with 20 minutes to spare and the place seemed to be filling up nicely. Away in the distance, the Sparta fans looked up for it in the Anfield Road end. As kick-off approached, it was time for my second sing-a-long a YNWA of the week. It was pretty atmospheric, and too close to call which version I’d enjoyed more – Anfield or Dortmund. I enjoyed holding my St Pauli scarf high in the Kop and didn’t get any disparaging comments from the home fans – although, it helped being sat next to Shaun, bedecked in a variety of vintage LFC paraphernalia. The flags down the front proudly proclaimed the club’s European heritage, although, again, after watching football in Germany the previous week, they couldn’t compare to the opening choreo provided by both Dortmund and St Pauli fans. Indeed, now watching the bulk of my ‘live’ football on the continent, the visual impact of English fans is light years away from their European counterparts. The lack of huuuuuge flags and banners must be health and safety related, but then again, I’m sure I saw some pretty impressive banners from the Aris Thessaloniki contingent at the City of Manchester stadium later that same night. The atmosphere inside Anfield started well, with the Kop going through its full repertoire of songs and the Sparta fans contributing well from the other end of the stadium. Unfortunately, the game dragged everyone down, frustration crept in on those Liverpool fans around us, and it wasn’t solely directed at the luckless David Ngog either. Fortunately, the ever industrious, Dirk Kuyt broke the deadlock and saved us from extra-time. Just as well ‘cos I needed a wee. I guess for King Kenny, it was a case of ‘job done’ without having to risk too many of his big name stars (Gerrard was sorely missed in midfield in a below par midfield.) But you couldn’t help thinking how far Liverpool’s European stock has fallen in recent times. Here they were struggling past Sparta Prague – a side that, our contact had informed us, lacked quality and had been shorn of it’s two best players in the January window – when just a few seasons before they had been beating the likes of Real Madrid and Barca in their own back yards. 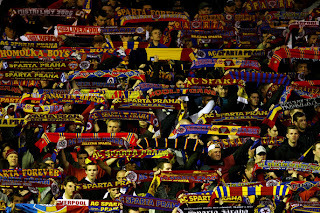 Still, the Kop had the decency to applaud the Sparta players off the pitch and then, a few minutes later, exchange applause with the fans who had traveled from Prague and who’d been relentless in their support of their team all night. It hadn’t been a classic Anfield European night by any stretch of the imagination, but it had been an enjoyable experience. To my mind, both the fans and the team were grinding out a result, with neither reaching top gear, but if they make it all the way to Dublin in May none of that will matter. Due to the tedious nature of the football, we spent much of the second-half continuing our Grand Designs riff coming, up with increasingly improbable suggestions to extend Anfield’s capacity. New stadiums are all very well, but I really think it will be a big blow to English football if Anfield is bulldozed. It holds too many great memories. For us though, it’s the taxi ride to the ground and the night in the hotel bar that we’ll remember. It might not have been ‘European’ in the strictest sense, and it certainly wasn’t the weekend, but it was great sharing a cab with an assortment of knowledgeable football fans from all over the globe. 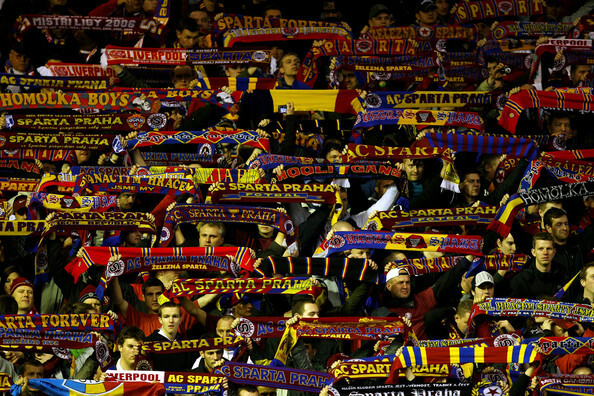 And, of course, there’s the symmetry of seeing two UEFA Cup games involving Sparta Prague, nearly 27-years apart. Neat.